Ladies if you’ve been struggling to find that perfect tailor who’ll make your dream suit a reality, fret not. Shabnam Ladies Tailor in Versova will stitch suits for you at a really affordable rate. Ahmed Master runs a tiny ladies boutique in Versova with a big signage declaring their ability to stitch Punjabi suits. 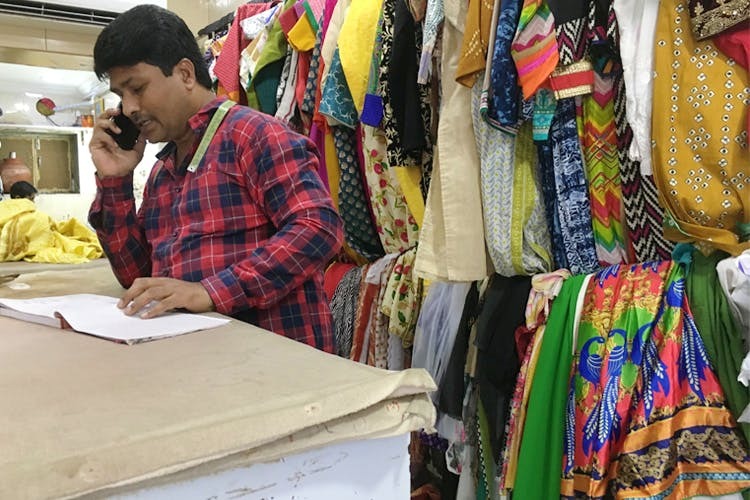 This place is a favourite among the Punjabi community in and around Andheri, and Ahmed Master is known to stitch up a beautiful suit piece customized just for you, in just a week's time. That too, at an affordable price. For everyone who found themselves lost in this city when it was time to find a trusted name when it came to tailoring, Ahmed Master will come to your rescue. He specializes in Punjabi suits, however he will stitch you anything you want. Show him a reference of what you are looking for and explain it to him in detail, and you can leave the rest to the 'Master'. You've got to be patient though, he only has two-three tailors working for him at a given point. A full suit and pant can be stitched up for INR 500. Yes, you read that right! The more the detail and intricacy of work, the higher the price will be, obviously. Get a blouse stitched at INR 325 and upwards. Katori blouses start at INR 400. Just the way you show an artist a reference of what you want, show Ahmed a reference and be rest assured about the final product. apart from stitching up wonders, you can get your salwar lining done for INR 700 and top lining for INR 550. After all, a stitch in time does save nine, doesn't it?! If you’re confused about the patterns, and designs, we suggest have a look at the racks of his finished pieces and you might just chance upon something that interests you.